Two masters, one from the West and one from the East, present an empowering co-teaching on the often-confusing subject of karma. Examine the most common questions of Western students on the subject of karma such as, "What is karma?" Is it superstition?" "Do you have to believe in reincarnation to understand it?" and, "How do I get rid of 'bad' karma?" Of the many Eastern wisdom teachings to have found their way westward, the notion of karma may be the most misunderstood—and most transformative. American-born teacher Pema Chödrön is renowned for making the wisdom of Tibetan Buddhism accessible, practical, and relevant for Westerners from all walks of life. But to bring us an understanding of the fundamental concept of karma, Ani Pema called on one of her own guides. On Karma, she is joined by Dzigar Kongtrül Rinpoche to present a two-part teaching session on this challenging subject. What is karma? Is it superstition? Do you have to believe in reincarnation to understand it? How do I get rid of “bad” karma? In a dialogue both illuminating and provocative, Pema and Kongtrül Rinpoche address the most common questions of Western students, discussing karma on the level of the individual, relationships, and the community and world at large. Session two then brings us an inspirational dharma talk with Dzigar Kongtrül Rinpoche, exploring the roots of positive and negative karma, how your “good heart” will shape this life and the next, service versus self-attachment, and much more. A mature view of karma empowers us to steer our lives through conscious choice rather than conditioned behaviors. Karma gives us a guiding light for living life at the level of cause, not effect, with responsibility and compassion. The Tibetan master on tape may be as proficient as one wishes him to be, but sadly his English is a crude second-year kind of level even if he has been abroad for decades. This is typically the case with these Tibetans. It's a pity but he struggles to get the point across. Great explanation of Karma. Not very scholar, but it wasn't the aim. The first part is a discussion, and the second part is a teaching of Dzigar Kongtrul Rinpoché. Both are very instructive and complete each others. This was disappointing. The format is kind of strange. The first CD has Pema interviewing Rinpoche. The second CD has Rinpoche in the studio. 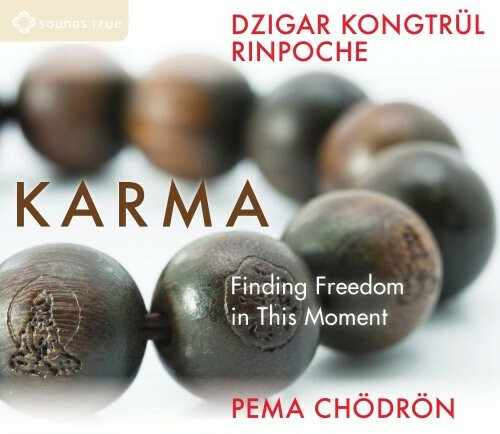 Karma is barely mentioned in the second CD and unfortunately Rinpoche is just not a good speaker. I was really looking forward to an exploration of karma and this set really missed the mark.